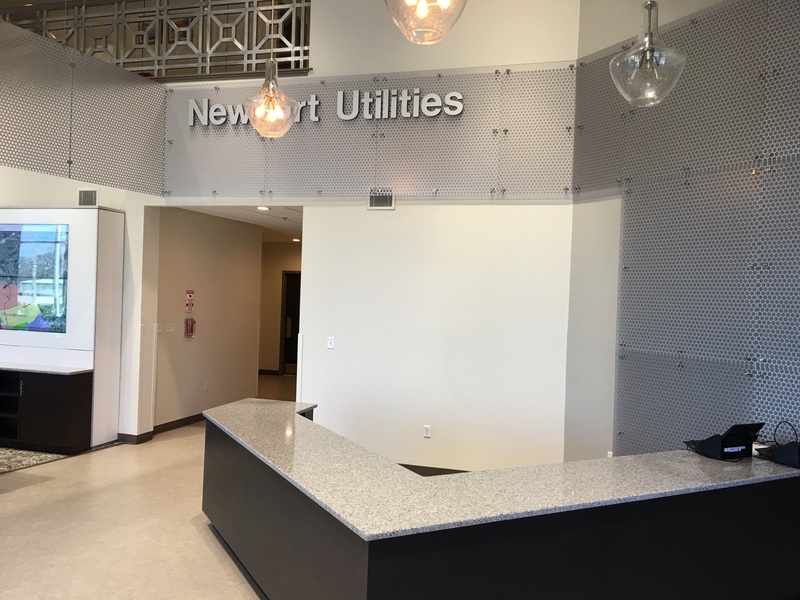 KNOXVILLE, Tenn. – Feb. 2, 2018 – Studio Four Design, a top Knoxville-based architecture and design firm, helped bring to life a new customer-focused, interactive lobby area for Newport Utilities, in Newport, Tennessee. The lobby was redesigned to put a spotlight on the Newport Utilities’ new offering of premise fiber optic cable broadband services. Previously, the lobby reflected a traditional utilities business, but now it’s an interactive experience center where customers can see and feel the superior performance of fiber broadband in data delivery, television viewing, and telephone service. Studio Four Design’s philosophy behind the design is to provide a more welcoming environment for utility customers as they enter the building, introduce interactive kiosks to visitors, and allow customer service team members to focus more attention on patrons who have billing or outage questions. Interactive Television Display – The focal point of the experience area is the interactive television display that will be used for customer demonstrations and learning. A set of four television screens work together to form a large touch screen surface, and with the addition of a controller, can also work independently to display multiple messages. Customer Service Workstations – The customer experience area incorporates two work stations for customer service representatives to complete customer orders. There is ample counter space to accommodate displays and product brochures, and the counters are a comfortable height for resting one’s arms. The area has sufficient storage cabinets and shelves to keep a convenient inventory of supplies to facilitate customer/agent interaction. Promotional Display – A large screen television adjacent to the interactive television provides an appealing display for videos, presentations or programming content for customer service and marketing purposes. Newport Utilities (NU) is a utility located in East Tennessee that provides electric, water, and wastewater services to citizens and businesses of Cocke County, Tennessee and surrounding areas. NU is a TVA power distributor that delivers electricity to approximately 21,500 customers in its 600 square mile service area. NU supplies quality water to more than 11,500 customers with over 4 million gallons of average flow each day. NU also serves wastewater services to approximately 4,450 customers using the most modern treatment techniques. NU has embarked on a FTTH deployment project and will soon offer the triple-play of fiber broadband services—internet access, video, and voice—to its electric customers. For more information, visit www.newportutilities.com. Since 2002, Studio Four Design has served as a premiere architectural and interior design firm to the Greater Knoxville Area. Their guiding principal is Design Matters, and their goal is to go beyond expectations to provide design solutions that positively impact their clients’ lives and organizations. Their team has worked on a variety of projects over the last decade that includes: churches, educational facilities, restaurants, retail buildings, athletic venues and much more. Studio Four Design takes pride in and is dedicated to all of the clients they serve. To find out more, call 865-523-5001 or visit http://studiofourdesign.com. Published on February 9, 2018 by Ripley PR.